The world's strongest man Zydrunas Savickas set a new Guinness world record for the 'Most Cars Pulled By One Man' when he towed 12 new Nissan Notes weighing in at a total 12,941 kg. of the greatest strongmen of all time, only had one attempt to set the new record. Wearing a specialised pulling harness and rope arrangement he pulled the 12 Nissan Notes over five metres accomplishing the feat in a staggering 32.9 seconds. Despite an extra 45 litres of loading space and enough legroom to accommodate the 1.91 m strong man, the all-new Nissan Note is 21 kg lighter than its predecessor. Which is just as well since Savickas weighs in at a staggering 170 kg! 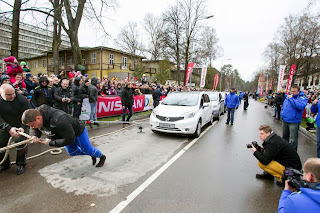 Held in Druskininkai, Lithuania, this world record attempt marked the end of the Lithuanian Car of the Year test camp with crowds turning out from all over the country to see their national hero Savickis set the new record. Savickas was presented with an official certificate from from Guinness World Records representative Jack Brockbank marking this major acheivement from the strongman. "We at Nissan like setting records and are always aiming high. Today we are delighted to have been able to help Zydrunas set another world record and to see so many people turn out to support him; it was a great way to mark the end of the Lithuanian COTY camp," said Taina Erkkila, Communication Director of Nissan Nordic Europe. "It is always great to set a new record, once I got into my stride pulling the 12 Nissan Notes was fine. Obviously, a big thank you to Nissan for helping me set the record and making it all possible," said Savickas.